Castle Comfort Stairlifts offers top brand stairlifts, keen prices and fast installs for all those seeking stairlifts in Penzance. And all work comes with our no-quibble guarantees and famous customer service satisfaction. As Castle Comfort Stair Lifts continue their journey south in Cornwall, we reach Penzance some 39 miles from Falmouth in Cornwall and 300 miles west-southwest of London and 75 miles west of Plymouth in Devon. Penzance is just 10 miles from Lands End the furthest southerly point in the UK. If you are looking for information about stairlift suppliers or funding in this area of Cornwall, Castle Comfort Stair Lifts can help. As the national agents for all manufacturers of stairlifts we can supply a suitable lift for your personal use. And don't forget that we can also supply purpose built wheelchair lifts and passenger lifts if you are looking for commercial versions (DDA compliant). If you would like more information about either option, please contact our local office on 01395 349198. Let's continue our look around Penzance. Sheltered by Mount's Bay, Penzance faces onto the English Channel with the largest UK fishing port of Newlyn to its west and the parish of Madron with whom it has close ties to its north. This location ensures Penzance's temperate climate which means it is milder than most of the rest of the UK. Named after the church that stood on the headland – Penzance means Holy Headland in Cornish – over a thousand years ago, Penzance existed as a small settlement from pre-historic times. Its location also has meant that over the centuries, Penzance has come under attack by the Spanish and pirates. And notably by a tsunami in the 18th century! The tsunami travelled from an earthquake epicentre in Lisbon, Portugal some 1,000 miles away bringing an eight foot surge of the sea around Penzance. The surge was quick and receded quickly too and no damage was recorded. Penzance really began to flourish and grow in the 15th – 17th centuries after being granted charters for markets and fairs, for permissions to charge harbour dues and granted the status of 'borough'. The arrival of the railway in the mid 19th century was good not only for the local economy but meant Penzance was accessible to tourists and those suffering less than good health were attracted by the mild climate. If Penzance has attracted you to retire to the area or if you have been lucky enough to live here all your life, but now need some help to get about, Castle Comfort Stair Lifts have some solutions. We can advise on the type of stairlift and also part exchange your old one for a newer version. 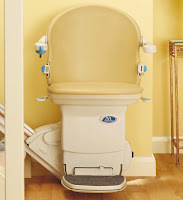 Castle Comfort can also point you in the direction of stairlift grants or 0% credit options. Remember you can use our £50 voucher towards your purchase. Many landmarks and tourist destinations surround Penzance which operates a ferry and a helicopter service to one of the favourites, the 'area of outstanding natural beauty', the nearby Isles of Scilly. Mousehole another fishing port, Marazion, St Michael's Mount and of course Lands End are all close enough to make Penzance your holiday headquarters. The area is also well known for its artistic community attracting over the years artists of many mediums to settle here. In fact, the Newlyn School was used to describe a group of artists who settled in the area in the late 19th/early 20th Century. Penzance itself has numerous galleries and a centre, Acorn Arts Centre for theatre, film and performance. Who do you know from Penzance? One of the most famous inhabitants of Penzance was Sir Humphrey Davy; this worthy chemist is best known for his invention of the miner's lamp aka the Davy lamp but also discovered laughing gas and with Michael Faraday proved that diamonds were made of pure carbon. Cornish & England cricketer Jack Richards was born here as was Maria Bramwell mother of the famous Brontés; as well as Stanley Johnson father of Boris. Comedian Sue Perkins lives in Penzance. There's no doubt about it Penzance in Cornwall is an attractive place to live. So that you can enjoy your time in this beautiful part of the country to the full, let Castle Comfort Stair Lifts help with your mobility. Watch our video and then call your local office on 01395 349198 for advice on the purchase or part-exchange of a stairlift – or anything else you need to know about stairlifts or other equipment to help you. to get the loot up those cliff faces - and help the girls "climbing over rocky mountains"